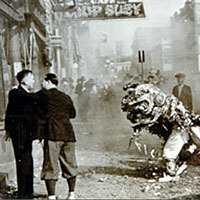 Chinese New Year in Portland, 1939; what looks like fog behind the lion dancer is actually firecracker smoke. Do you love to see fireworks? The Chinese developed them more than 2,000 years ago. Over the centuries, fireworks have developed into the colorful and elaborate displays we see today. Around the world, Chinese New Year is the biggest celebration of the year for people of Chinese heritage. The date of the Chinese New Year is based on the cycles of the moon, or the lunar calendar, so it's often called Lunar New Year. Because of this it doesn't take place on January 1. It usually occurs about a month later, and in China it is celebrated for 15 days! The Chinese used firecrackers on New Year's Eve to send off the old year and welcome the new one. They also believed that the sound of firecrackers bursting would help chase away the mythical monster, Nian, who was believed to have terrorized the people of China. In the 1850s many Chinese people came to Oregon, when gold was discovered in the southern part of the state. By the mid-1870s, the Chinese were the largest ethnic group in Portland. Portland's Chinese New Year officially begins with a ritual lion dance performed by musicians and dancers in elaborate costumes. The lion dance is intended to chase away evil spirits and bring good luck. As you might imagine, lots of firecrackers are set off during the celebration, too.